We at Hog Master, make the Hog Master Hog Roasting Machine, if you didn’t already know. Why do we make the Hog Master you might be thinking? Well 5 years ago I used to work in a mobile catering industry. From there I learned a vast knowledge of culinary skills on the move as well as the mobile catering equipment I were using. I wanted to test my skills in a different way so I started up a small hog roast catering business, which I ran from my home as well as doing my regular job. I worked locally trying to get a name for my business and it worked! Cooking traditional fresh food in front of the customer’s eyes, they absolutely loved it the smell of the succulent pig roasting away, the taste of the perfectly roast pig and not forgetting the crispy golden crackling. I had always purchased my hog and spit roasting equipment and machines and were frustrated with the limitations I had, I made so adjustments I might as well have built one from scratch, then one of my spit roasting machines cause me all sorts of hassle then I thought building my own would be so much easier since I can customize it around my needs. This was a huge project which I planned for myself to launch my catering business, but then during the design stage it hit me we was onto to some special, if I had so many problems with buying a machine other people out there may feel like me. A full year later we had designed, developed and tested we had created the Hog Master with a full range of accessories. 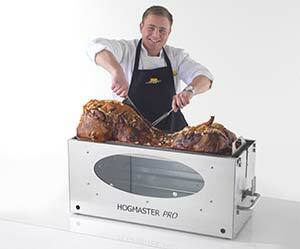 We have been selling our Hog Master ever since and I am still stunned at how far this hog roasting machine has come. 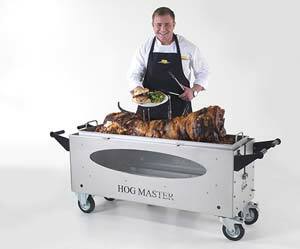 From being a mobile caterer to owning a well known business in the UK and other counties like Austria, Poland, Saudi Arabia and hopefully other countries will hear of us and buy one of our esteemed hog roasting machines, we are still looking to the future of the Hog Master, creating new and exciting things for the Hog Master, making it better for you the customer, your catering business, your restaurant, or even your family and friends, hog roasting is a unique experience like no other so why not give it ago, and give it ago with the Hog Master. The Proud Pig And Their New Venture With A Brand New Hogmaster!